Happy Sunday! Today’s #SundaySupper theme is garden recipes. I was thrilled when I found out what this weeks theme was going to be. I love growing fresh herbs in the summer and using them in my recipes. They really brighten a dish. 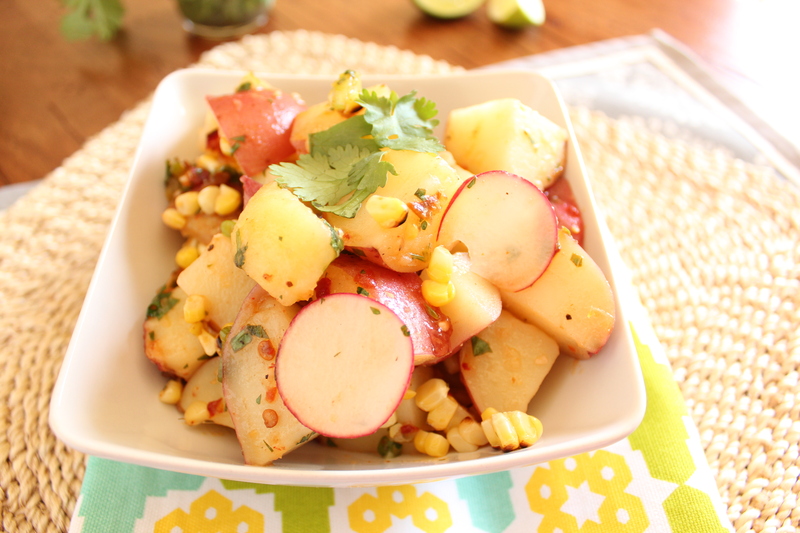 I made Red Potato & Grilled Corn Salad with a chipotle lime vinaigrette for this week’s #SundaySupper. It’s perfect for summer picnics, barbecues, and deck parties. Not only is this salad delicious, it’s healthy. There is no mayo in this salad. 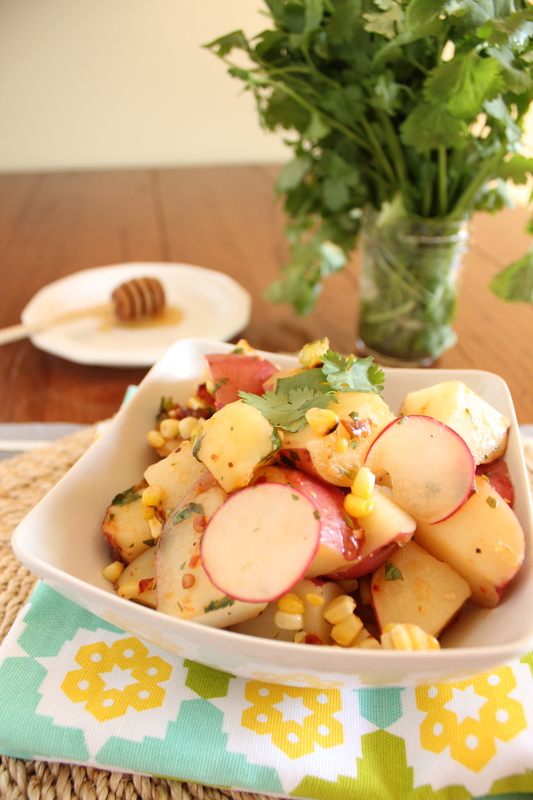 This salad is full of fresh garden ingredients: red potatoes, radishes, grilled sweet corn, scallions, and fresh cilantro. The vinaigrette that tops the salad is amazing. It’s made with spicy chipotles, tart limes, and sweet honey. Sweet, tart, and spicy is my favorite combination. 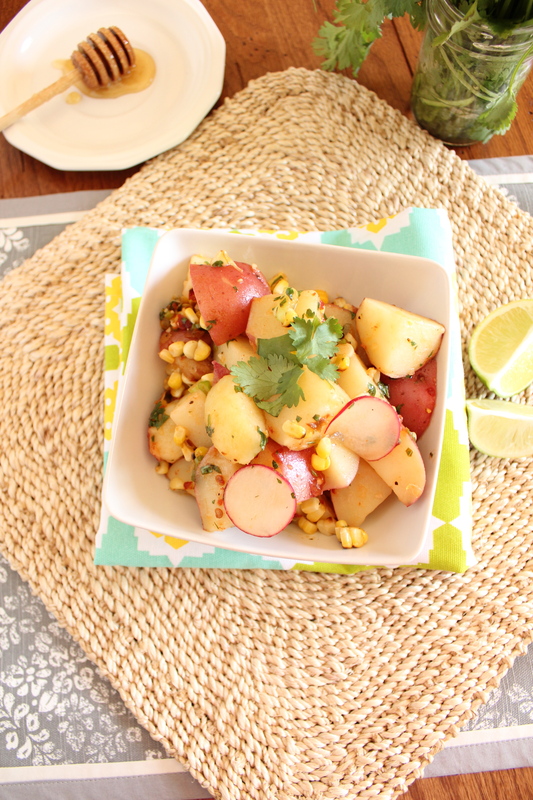 This Red Potato & Grilled Corn Salad is extremely easy to throw together. That’s what I love about. If you have a last minute party to attend, don’t worry, this salad can be made in 15 minutes. In a medium saucepan cover potatoes with water. Bring to a boil over high heat. When the water begins to boil, add some salt to flavor the potatoes, about 1/4 cup. Reduce heat to medium and cook potatoes until tender when pierced with a knife or fork, about 15 minutes. When the potatoes are tender, drain and rinse with cold water. Add potatoes to a large bowl. While the potatoes are cooking, preheat a gas or charcoal grill (feel free to use an indoor grill). Drizzle corn with olive oil and salt and pepper. Cook the corn directly over the heat until the kernels are brown all over, turning often, about 8 minutes. Remove from grill and set aside. When the corn is cool enough to handle, cut kernels off the cob. Add corn, scallions, radishes, and cilantro to the bowl with the cooked potatoes. 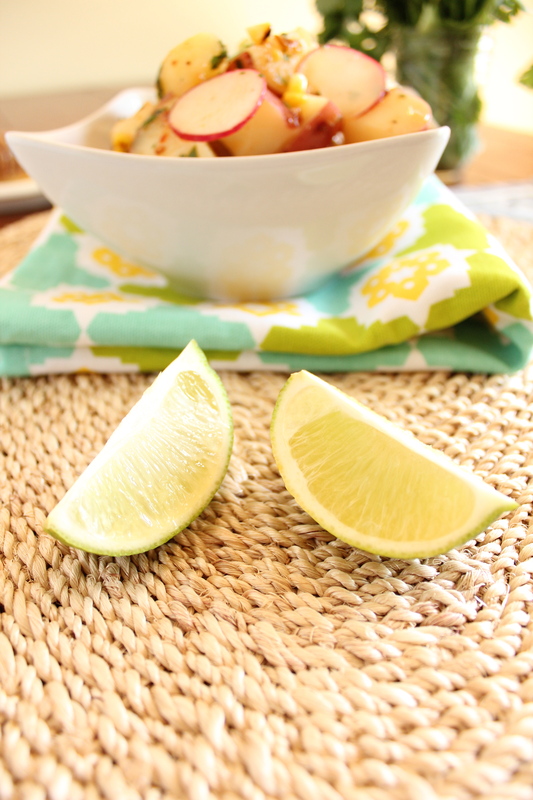 In a small bowl, whisk together lime juice, chipotle in adobo, garlic, honey, and cayenne. Slowly whisk in olive oil. Add salt and pepper to taste. Pour vinaigrette over potato mixture. Toss to combine. Add more salt and pepper to taste. It might be only 7 a.m., but I’m wanting this right now. Excellent. Bookmarked! Thanks, Adam. I eat lunch for breakfast sometimes. It feels naughty. Perfect side dish to steaks cooked on the grill! Thanks, Renee. It would do perfect with a big, juicy steak. Mmmmmmm. I love the cilantro and adobo in this! I’m pinning this one, my dear. AWESOME recipe! Thanks, Jen. I think you’ll love it. I was trying to figure out what to serve with a brunch today. I am serving your salad. Lovely picture! Wow, thank you. I feel so honored. Let me know how you like it. This sounds so great for a summer BBQ. Can’t wait to try it! You make it look so delicious. . This looks like a great salad for BBQ season… I bet it would be the perfect pairing with a big juicy steak fresh off the grill! :) I just love that bright pop of colour from the radishes and corn, too. Thank you, Isabelle. I agree, it would go great with a big ol’ steak. Thank you. In the summer, I think mayo is too heavy. This salad sounds amazing! I need to make this soon for sure! This looks so good! I feel like I always go to bbqs with a mayonaissed potato salad. So excited to have an alternate! This looks so delicious! I love potatoes salads that don’t use mayo. This is perfect for a BBQ! I love this salad, so simple, but full of flavor. especially with the /chipotle Lime Dressing. Comgrats on the Top 9 today! Thanks, Becky. I was thrilled when I saw it on the top 9 list this morning. Congrats on the top 9! This is a great salad, I LOVE, LOVE, LOVE potatoes! Thanks, Sofie. It is now one of my favorite salad recipes. Thank you so much. I am thrilled! this looks delicious Jennie! and that chipotle lime dressing sounds super amazing! Thanks, Jenn. It was a really yummy salad. Now I know why this made the top 9!! The radishes kinda throw me off a little, but I love red potatoes and corn. Saving this recipe for sure!! Thanks, Carla. The radishes add a lovely crisp crunch to the mix. Ooo! This salad sounds amazing! So fresh and I just want to dive right into it. Thanks, Ann. You’re only about 40 minutes away from me. I love having blog neighbors. Thanks for your lovely comments. I’ve never heard of this before! Such a great idea! Thanks, Kayle. I found the recipe in a magazine, and I changed it around a bit to suit my tastes. The results were delicious. Looks delicious, fresh, and perfect for spring! Love that there’s no mayo in there, too. What a fresh and flavorful summer meal! I make something similar with potatoes, fresh corn, dill butter, and fish all wrapped up in aluminum foil and thrown onto the grill. If you’re interested, it’s called my “New England Seafood Bake”! Oh my this is gorgeous. I love how you’ve combined things I would not have thought of here. I must try this one. Chelsea, thank you so much. I’m honored. Ana, missed the last one and felt terrible, too. I have been so busy with school. Finals- ugh! Thanks for the lovely compliment. jennie, this week you all really outdid yourself with the Sunday Supper. i love, love, LOVE your salad. i have a tiny weakness for salads with corn in them, and the combination of the corn, the potatoes and all the other good things sounds amazing. can’t wait to try this! Thanks, Shannon. I adore this salad. It’s a perfect summer salad. These are great elements for a southwestern salad! I hardly see that much of radishes, except in leaf salads, so I like that you used it here. Also, the dressing does spark and interest as well with notes of citrus and heat. Well done! Yum….what a great combo….I will leave out cilantro though…just not a fan.. but all the rest count me in! Just found your site thru your twitter…glad to be here! Thanks for finding me and for the lovely comments.